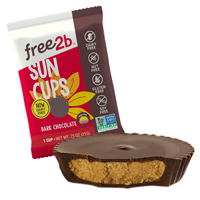 These allergy-friendly chocolate cups are a real treat. Gourmet-quality chocolate is filled with a deliciously creamy sunflower butter center. A super combination in its own right—you won't miss the nuts at all. From the package: Our dedicated facility is: Peanut Free, Tree Nut Free, Dairy Free, Gluten Free, Soy Free, Egg Free, Sesame Free. And free from corn, coconut, mustard, fish and shellfish. Additional information from the manufacturer: All free2b treats are made with love in our top 12 allergen free facility. Kosher certification: Certified Kosher by EarthKosher. 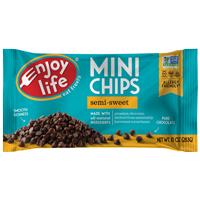 Each 0.75oz/21g package contains 1 cup.